Would you like to experience more peaceful running or more enjoyable runs? Do some runs feel extremely difficult and others much easier? What is the underlying difference? We often tell ourselves stories to justify why a run was particularly bad or good but at the end of the day, we have a choice. We can choose how we react to whatever it is that we are experiencing. 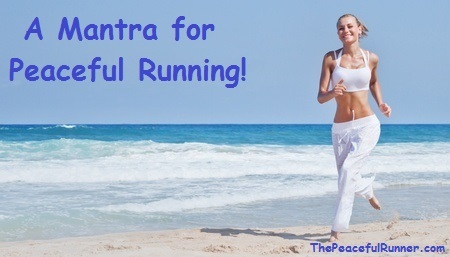 A mantra practice can help us to choose more wisely and enjoy peaceful running more often. Try this next time you are not feeling peaceful while running. It doesn't matter what has taken away your peaceful state of mind. It could be that you are frustrated because your running watch has stopped working properly. You may be feeling too hot or too tired, you may have a sudden ache or pain or maybe you have a recurring health issue that is threatening your ability to run. Whatever the reason, use the mantra below to help bring about more peaceful runs. Try repeating the following mantra: "Allow What's Here." This mantra helps you to become fully present to what you are experiencing. As you repeat the mantra, continue to feel and experience what you are feeling, such as your emotions and any physical sensations, but also notice the stories that you are telling yourself about the situation. These stories and interpretations will have an element of judgement and this is what we need to let go. When we judge something as not being good, we have a desire to change what we are experiencing and this is what creates suffering. "Resistance creates suffering. Stress happens when your mind resists what is. The only problem in your life is your mind's resistance to life as it unfolds." For example, if you are experiencing pain while running allow the pain to arise but let go of your judgement of the situation. Do not indulge in the stories that you tell yourself about the pain, such as, "this must be happening because I ran too much or too fast last time" or "I must be getting arthritis in my knees" or "maybe those new shoes I bought are not right for me" or "I must have done something wrong." Let go of all these interpretations of what is happening and just "be" with what you are experiencing without judgment or criticism. This practice can feel difficult and uncomfortable at first as allowing pain and discomfort to arise is not something we are used to doing. Our instinct is to push away what feels uncomfortable for us. By allowing "what's here" into our consciousness, we become more peaceful and receptive to all our experiences. Not judging them allows us to flow more easily with life allowing us to enjoy more health and happiness. This affirmation may also help us to stay present to what's here: "I am here and the time is now." The situation may not go away immediately but after a short time the psychological suffering will be gone and you will find yourself in a more peaceful place. When we notice the stories or thoughts we have about a situation, we can begin to realize that it is the thoughts we have about the situation that causes suffering and not the situation itself. When we begin to notice this, it helps us to realize that we are never upset for the reasons that we think and just how powerful our thoughts can be. Allowing all experiences to come and go without resistance or judgments will help you have more peaceful runs with less injuries and suffering on all levels.